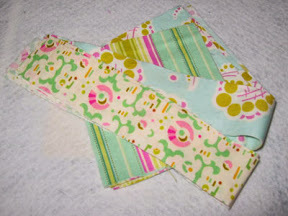 I’m so thrilled that I was given the You Make My Day Award by Janet over at Nuts About Needlepoint. 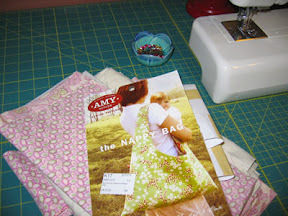 I read her blog faithfully as I too am a little nuts about needlepoint. That was a great way to start my weekend. Thank you, Janet! I’m going to be doing a shop update on March 9th! Focus will be on sewn goods (iPod cases and make a tote or two). But of course I reserve the right to add in some jewelry! I know you’ve not been sleeping well at night, wondering how I spent my long Presidents’ Day weekend. My mom drove down for a visit. Actually, she drove down to be put to work. 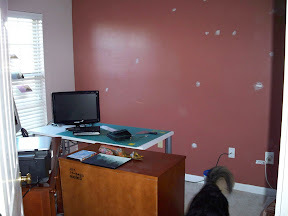 I’ve wanted to repaint my croffice (craft room/office). I was being bold and painted one of the walls a reddish brown. It looked okay, but wasn’t the right color. I was ready to go a little more neutral so activity #1 was to repaint two walls in my room. Doesn’t sound like too difficult a job, but it took half a day to paint. I won’t even mention all the time it took to take everything off the shelves and walls and temporary relocate 75% of the stuff in that room (which I did prior to Mom’s arrival). 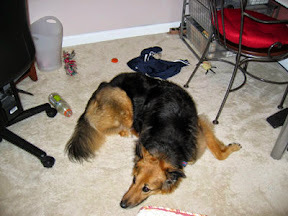 I went through it with an eye toward getting rid of stuff, but there really wasn’t that much fluff. 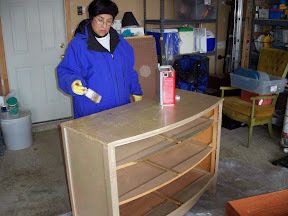 Our next activity was working on a chest of drawers I bought at the Salvation Army in the fall. I saw the chest and knew that I wanted to make it into a buffet for my dining room. My china hutch is overflowing and my table linens are in a drawer in my bedroom. My silver is in another hutch… Stuff is all over the place. I am looking forward to being able to consilidate those things into this dresser. 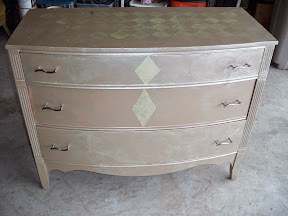 The original plan was just to paint the dresser by my mom insisted we remove the paint from the top and stain the top. This way it would match my little hutch. As she was willing to do the paint removing, I said “sure!”. Well, once the paint started to come off, the wood looked great and we decided to strip the whole thing. We made a good start on this, but we didn’t finish. There’s a lot of paint left to be removed and then there’s some repair work and then we can work on the painting/staining. Lest you think I worked my dear mother too hard, we also found time to go to a small flea market, see Atonement, eat lots of good food, watch other movies, take naps, and watch some Martha Stewart. And that was just on Saturday and Sunday. There were other activities on the list, but on Monday we took it easy. Fortunately, the weather cooperated and it was unseasonably warm. 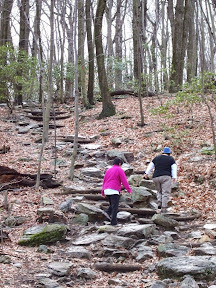 We drove to Sugarloaf Mountain and enjoyed a wonderful hike. Except for the gunshots in the background (which we attribute to a civil war reenactment and NOT hunting (please, let me just continue to believe this)) it was a perfect hike. Ooh, and I got my mom started on a needlepoint. She used to do a lot of handwork, probably 25+ years ago, so I gave her a small project. We’ll see how it goes. Photos: 1. Croffice ready to be painted, 2. Dresser from the Salvation Army, 3. Mom stripping paint, 4. 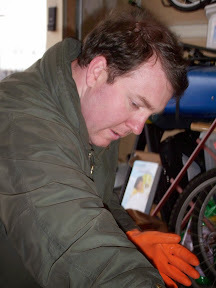 Bill helping strip paint, 5. 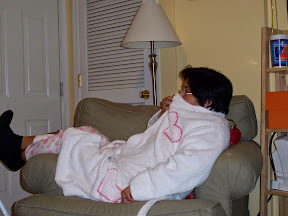 Mom watching a tense moment in Casino Royale, and 6. Me and Mom hiking. who wouldn’t let me craft. Would you buy that as a reason for my absence? I didn’t think so… Once the heat was turned up, my productivity and motivation went the other way. I have been working on a few things and I made a lot of progress this weekend so I finally decided I had something to write about. A couple of weeks ago, I cut some fabric to make myself some out and about pants. 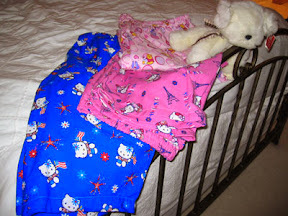 Sometimes I wear them as pajama bottoms, and sometimes I wear them as lounge pants. And I have no problems wearing them out and about for a quick trip to the Michaels or Dairy Queen.